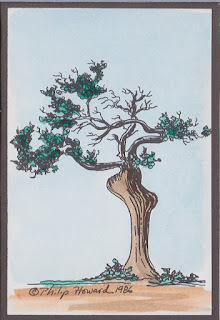 For more than four decades Village Craftsmen has used a windswept tree as our logo. Recently a reader asked about the logo. Although there are a number of such island trees, sculpted by wind and salt spray, a particular tree was the inspiration for our logo. The tree is located just a short distance north of the National Park Service campground, on the sound side of NC12. In the 1950s and 1960s it stood in a small clearing a few feet from the new highway, and was often photographed. Some people called it the "dancing lady" because of its graceful curves. Unfortunately, the tree died a number of years ago, but it still stands, a ghost of its former beauty. Today it is surrounded by much other vegetation, and difficult to locate. 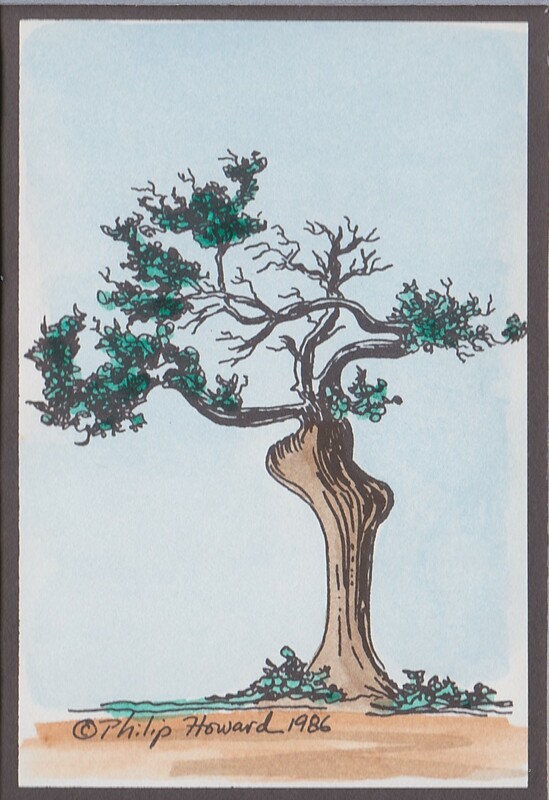 Village Craftsmen's logo is modeled on this tree and other similar trees. It is a symbol of Ocracoke Island and how it has been shaped by the forces of nature. 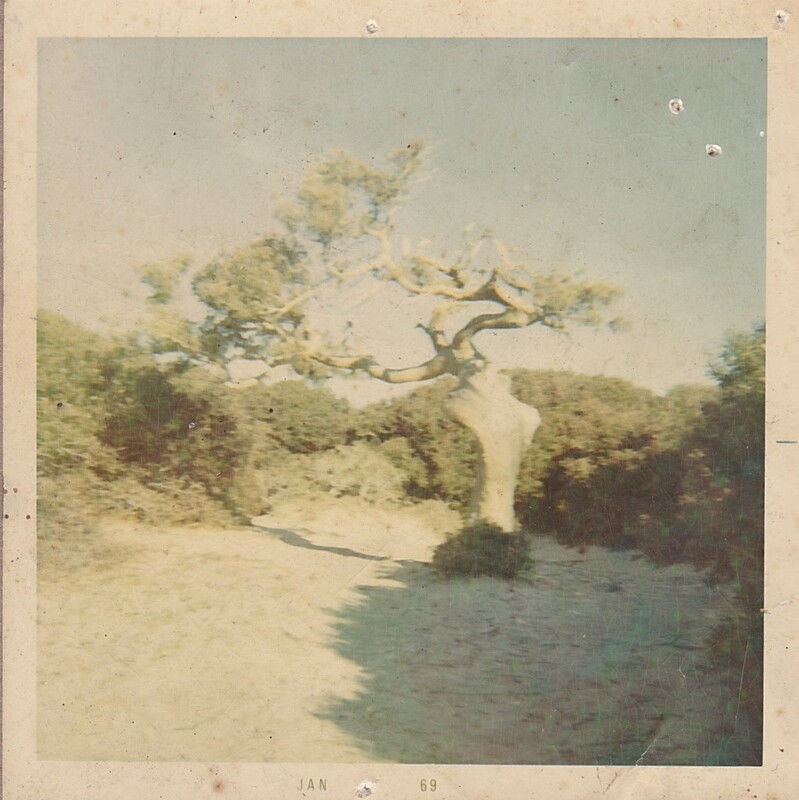 We have a photo of this tree in our house on Ocracoke that Leroy O'Neal's wife, Renie, found in a department store in New Castle, Delaware. The tree "dancing lady" looks more like Lilly LangTREE to me. But hey, thanks for the story. I've always liked the logo. It does capture the island, in my opinion. That tree has been a special tree to me my entire life. I've been coming to the island since I was an infant. I always begged to stop to see that tree. I've had my picture taken next to it several times. I do recall feeling a bit sad when we noticed it was mostly dead. I've wondered back in there a few times to see what remains of it. I just love that area of the island and the beautiful live oaks. Thanks for the memories! trees in the mountains look the same way. a tree in the wind.